It's here! Like many of you, I’ve been counting the days to the start of IPL matches. Five days into the tournament, the cricket in IPL 2010 has already begun to live up to all that it promised. In it’s third season, IPL is an event that brings together sport and entertainment, with international cricket stars on the field and Bollywood actresses in the stand. This year for the first time, fans around the world can tune in to IPL’s YouTube Channel to catch all 60 matches and 43 days of play. Now, no matter where you live in the world, you can get front row seats to the hottest cricket action. Over the next weeks of the tournament, I’ll be joining you in YouTube’s virtual grandstand - cheering for my favorite players, watching the flippers and outswingers, and analyzing each wicket. I’ll be blogging about my experience of watching cricket on YouTube as well as sharing my favorite matches, highlights clips, and more. You can also expect a few insights into what’s been popular around the world. How’d I become such a cricket fan? Well, like many of you, I’ve had some experience on the field. I’ve played school, college and league cricket in Delhi, played for the Singapore national team for over five years, and today am a member of the committee that selects the national cricket team for Singapore. 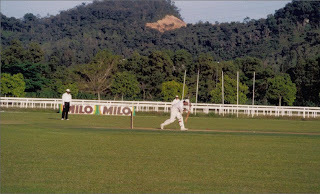 For your entertainment, I’ve included a picture below of me in my cricket whites. As I blog about my IPL highlights, I want to hear yours! Please share your thoughts in the comments below. Google has done a great job with IPL on youtube. It is sp suprising its so smooth and so clear i have never seen it buffering. Sajith, yours and youtubes efforts are much appreciated. I look forward to some good postings from you on IPL.